The mission for an end to hunger in the world’s most populous region has received a boost, with FAO member countries responding positively to a call by the Organization’s Director-General José Graziano da Silva for a “massive effort” to end hunger in Asia and the Pacific. Speaking at the 32nd FAO Regional Conference for Asia and the Pacific, Graziano da Silva, pointed out the “remarkable results” achieved in some countries of the region in reducing hunger. 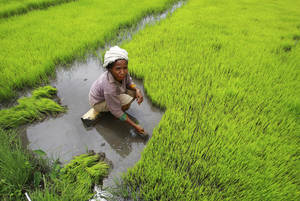 While the region is on track to achieve the MDG hunger goal, more must be done, the FAO chief said. Even if Asia and the Pacific reaches the target of 12 percent, it would still have well over 500 million hungry people, more than all other regions combined. “We must not tolerate a situation in which a single man, woman or child is still condemned to suffer hunger in this prosperous region where there is enough food for all and the means exist to put an end to hunger,” Graziano da Silva said. The Director-General invited all countries “to take on board the Zero Hunger Challenge, engaging all their people in a massive effort” to bring about a lasting end to hunger in the region by 2025. The government of Timor-Leste has already taken up the call, launching the region’s first National Zero Hunger Challenge earlier this year. “The launching of the National Zero Hunger Challenge in January of this year marks the beginning of our mission to have a food-secure and nourished country,” Marcos da Cruz, Vice Minister of Agriculture and Fisheries, told participants, adding that Timor-Leste has among the highest proportions of child stunting, under-nutrition and infant and child mortality. “We are working much more closely with governments, with international and regional institutions, with civil society and with the private sector to advance our goal of a food secure and sustainable world,” he said. Family farmers and smallholders “do so much with so little, imagine if (they) received greater support from governments,” the Director-General said.